The Kingdom of Hungary drew considerably from the political and cultural heritage of Great Moravia. In the year 1000 the Hungarian kingdom was established by King Stephen, who united the old Hungarian tribes under his reign and adopted Christianity. Under the protection of Byzantium, he ranked among the greatest governors of Christian Europe. By using the creative potential of the domestic population, and with the help of foreigners, he laid the lasting foundations of a state which was to survive until the end of the First World War. The main bases of the new kingdom were situated in Slovakia. This fact is substantiated by many preserved monuments, not only sacral (churches and monasteries) but also secular (residential and fortified constructions) monuments with which Slovakia fully integrated itself into the uniform medieval culture which mastered the whole of Europe. The kingdom also experienced a specific transformation of foreign, especially western and southern, creative styles. Knowledge about Slovakia between the 10th and 12th centuries is still insufficient. An opinion prevailed only a few years ago that Slovak territory was only partially populated during this period, that a great part of the country was covered by dense forests and that existing architecture used only wood. Research results of the last few decades, however, prove that almost all of the Slovak regions were already more or less populated at that time and that a Slovak element prevailed. The majority of architecture was certainly made of wood, as that was an easily accessible and ever-present material. However, many constructions were also made of stone and brick. These were mainly built by the clergy and lords and in the Romanesque style, the features of which came from France, Germany and Lombardy. Romanesque architectural forms were used up until half way through the 13th century. The increased building activity was connected with changes in the organisation of the church. The principle of large vicarages required the building of churches that would be accessible by the surrounding population. Churches were constructed adjacent to castles, mansions and monasteries and in many other rural areas. These were built by the clergy as well as by the local lords of manor houses. Manorial churches were characterised by an empora (elevated gallery) on the western side. The churches were simple, with an oblong nave and a semicircular apse. They were often built in elevated places, becoming significant dominant features of the countryside. 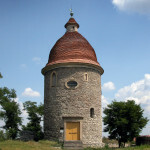 Rotunda (such as those at Skalica and Dechtice) represented a specific type of Romanesque-style construction which served as parish or manorial churches as well as charnel houses. Apart from stone constructions, there were also churches made of un-rendered brick which reflected the Italian style of architecture. These types of churches are prevalent in Southern Slovakia where there was a lack of other building materials (Diakovce, Čierny Brod – Hegy). Building activity was also stimulated by the foundation of priories and canonries. The late Romanesque cathedral in Spišská Kapitula ranks among the most important works of the 13th century. The number of preserved visual and creative works of art in the Romanesque style is much lower in comparison with extant examples of other architectural styles. However, several portals, reliefs, baptisteries and stoups in the Romanesque style have survived. Interiors were generally decorated by wall paintings. The oldest ones include the paintings in Kostoľany pod Tríbečom. 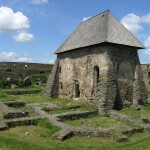 The holy orders contributed most significantly to the development of Christian architecture in Slovakia. The first monasteries were founded by the Benedictines (Hronský Beňadik, Diakovce, Krásna nad Hornádom) and the Premonstratensians (Bíňa, Bzovík, Kláštor pod Znievom, Šahy, Jasov and Leles). 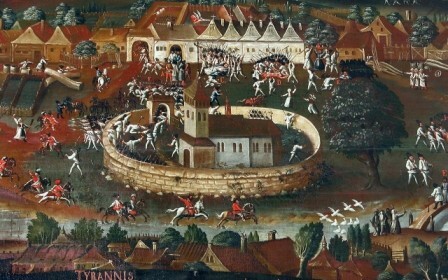 In the 13th century, they were followed by the Cistercians (Spišský Štiavnik), the Dominicans (Banská Štiavnica and Košice) and the Franciscans (Bratislava and Košice). The construction of monastic compounds came to form important architectural elements in the countryside as well as in the towns.